Computer monitors grab their video signals from the video circuitry in your computer, so you can tell what type of monitor you need by looking at your computer’s video port — the little connector on the back of your computer where you plug in the monitor’s cable. 1Determine what video port (or ports) are on your computer. Fortunately, many computers come with several video ports, so they’re compatible with several types of monitors. 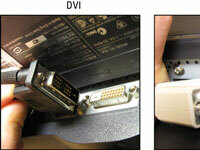 You may have an analog (VGA), digital (DVI), or High-Definition Multimedia Interface (HDMI) connection. 2Figure out what features you need (or want) and how much you’re willing to spend. 3If you have a desktop computer (rather than a laptop), shut down Windows, turn off your computer, and unplug and remove your old monitor. Unplug your old monitor’s power cord from the wall before you unplug the monitor’s video cable from its little port on the back of your computer’s case. 4Remove the old monitor from your desktop. Don’t throw your old monitor into the trash because many monitors contain noxious chemicals. 5Remove the new monitor from the box, place the monitor on your desk, and push the plug on the end of its cable into your computer’s video port on the back of your computer. The cable should fit into only one port. If the cable doesn’t fit right, you’re either trying to plug it into the wrong port, or your monitor isn’t compatible with your computer. 6Plug the cable’s other end into your monitor’s matching port, and plug the monitor’s power cord into the wall or a power strip. 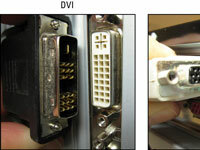 This port can be DVI, VGA, or HDMI. 7Turn on your monitor and then turn on your computer. You should be able to see words on the screen as the computer spews its opening remarks. 8If you bought a fancy monitor with speakers, cameras, or other goodies, plug the cords from the monitor’s speakers or camera into their spots in the back of your computer. If Windows doesn’t recognize your new monitor’s special features, you probably have to install the drivers that came on the CD that came with the monitor.